Industry Experts, Inc. introduced the new market research report on Smart Materials. 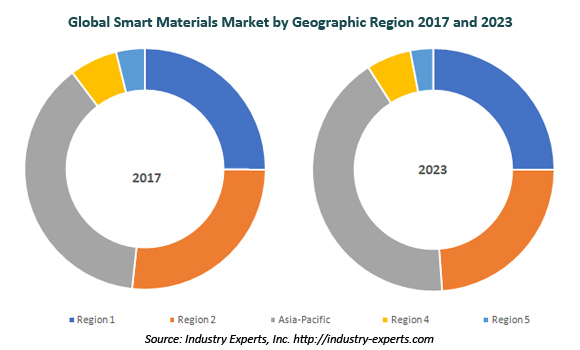 According to this comprehensive in-depth market report, exploring the market for various materials types/sub-types of smart materials, entitled “Smart Materials – A Global Market Overview” reveals that the Asia–Pacific is estimated the largest market in 2017 accounted US$16.2 billion. The region is also projected the fastest growing market through to 2023. Smart Materials constitute a class of advanced materials capable of sensing and responding to a wide variety of stimuli that can include electric and magnetic fields, temperature, pressure, mechanical stress, hydrostatic pressure, nuclear radiation and pH change. The inherently unique characteristics of these materials make it possible for them to revert back to their original state after the external stimulus is removed. This next generation of intelligent materials displays adaptive capabilities and alters its physical properties such as shape, stiffness and viscosity in a specified manner. Smart Materials have multiple functionalities, such as self-adaptability, self-sensing, self-healing and memory, which allow them to be used in a variety of applications. As per the findings by the analysts at Industry Experts Inc., Phase Change Materials (PCMs) constitute the fastest growing material type with a robust 20% CAGR in the global market for Smart Materials. The increasing application of structural products in applications, such as building resources, electronics cooling, energy storage, shipping and packaging would further propel demand for these materials. Piezoelectric Materials corner the largest share of the global Smart Materials market, accounting for a forecast 66% share in 2018. The report reviews, analyses and projects the Smart Materials market for the period 2014-2023, globally and the regional markets comprising North America, Europe, Asia-Pacific, South America and Rest of World in terms of value in USD million. The regional markets further analyzed for 15 independent countries across North America – The United States, Canada and Mexico; Europe – France, Germany, Italy, Russia, Spain and the United Kingdom; Asia-Pacific – China, India, Japan and South Korea; and South America – Argentina and Brazil. Smart Material types analyzed in this study include Electrostrictive Materials, Magnetostrictive Materials, Piezoelectric Materials, Phase Change Materials, Shape Memory Alloys and Other Smart Materials (includes Wet Electroactive Polymers, Electrorheological and Magnetorheological Fluids, Electroluminescent and Photoluminescent Materials and Electrochromic Materials). The market for these key material types further drilled down for sub-types consisting Electrostrictive Materials – Lead Magnesium Niobate-Lead Titanate (PMN-PT) and Polymers; Magnetostrictive Materials – Ferrites and Rare Earth Materials; Piezoelectric Materials – Piezoceramics, Piezocomposites, Piezocrystals and Piezopolymers; Phase Change Materials – Bio-Based, Inorganic and Organic; and Shape Memory Alloys – Copper-Based, Iron-Based and Nickel-Titanium. This global 520 page smart materials market study includes 364 charts (includes a data table and graphical representation for each chart), supported with meaningful and easy to understand graphical presentation, of market numbers. The report profiles 28 key global players and 43 major players across North America – 18; Europe – 17; and Asia-Pacific – 8. The research also provides the listing of the companies engaged in smart materials industry. The global list of companies covers the address, contact numbers and the website addresses of 143 companies.